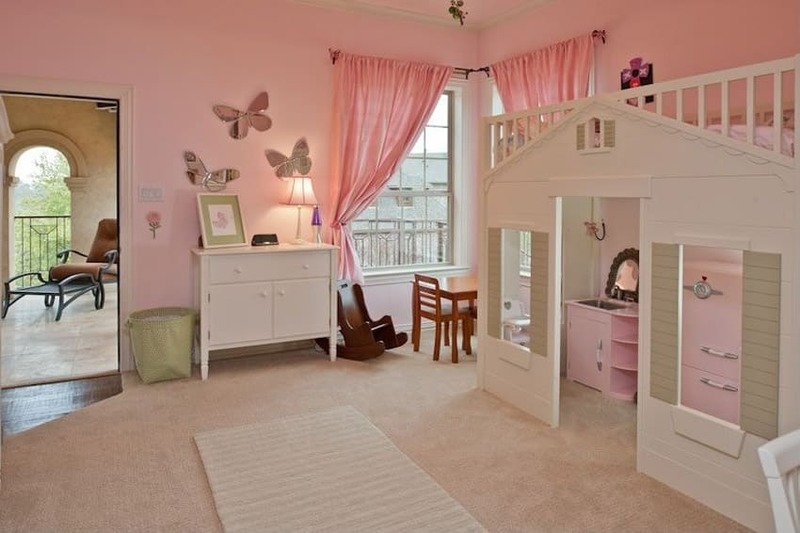 Welcome to our gallery of little girls bedroom ideas. These girls bedroom decorating ideas include creative and fun ideas for creating the perfect little girls bedroom. Get inspiration for furniture, decor, paint colors and accessories that will match your girls personality and style. Featured in the picture above, kids will definitely love the blackboard wall in this neutral-toned bedroom, which allows them to let their imagination run free. Planet and star decals also dot the white wall by the low bed, and is matched by the moon crater chalkboard art and rocket decoration. The warm wood makes for a homey feel amidst the white furniture and white curtains, while the fanciful prints on the bed sheets and chair makes the room feel whimsical yet cool. Girls love an attractive bedroom that’s decorated with their favorite colors. 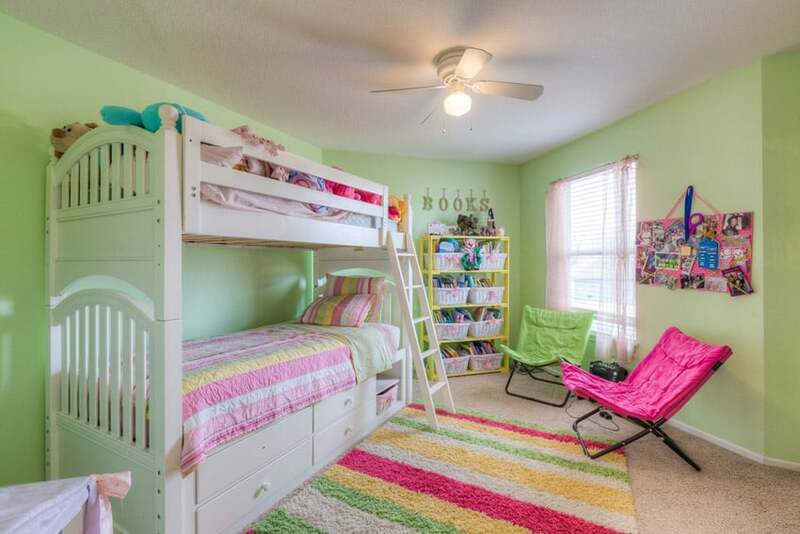 Many girls’ rooms are designed and decorated with light colors which are enticing and playful. It is essential that proper combination of hues are utilized in order to achieve a wonderful bedroom color scheme. The top colors used are pink, lilac, purple, light blue, orange, and green. There are other color combinations which can be used for room design. 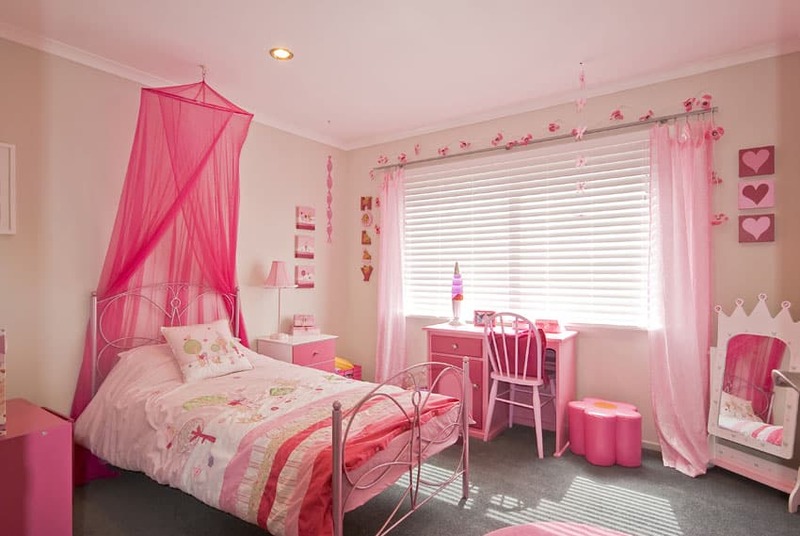 For traditional girl’s bedrooms pink is often used as the color because it represents princesses. Other little girls bedroom ideas use themes such as Disney characters, butterflies, fairytale elements or flowers are also popular choices. You can choose a theme that fits your child’s personality such as her hobbies, specific interests, or favorite TV show or movie. Chalkboard walls – A great way to promote her creativity is to install a wide chalkboard to the wall. with a chalkboard wall she can create art and change the rooms appearance any time she wants. Mini-art galleries – Create gallery style collections of her art work and display them on her walls. This is an inexpensive way to decorate that will let her personality shine. Wall decals – There are many different wall decals to choose from to fit the style you want. Create a space themes wall and ceiling with stars and planets or add flower decals to create a whimsical space. Add a message board – A cork-board can be attached to the wall for family and friends to leave messages. These are inexpensive to purchase and fun for visitors to leave a note for their friend. Stuffed animal art – If she has a big collection of stuffed animals why not show them off? With wall shelving one can create a stuffed animal display that turns these toys in to decor she’ll love looking at. Accessorize with colorful patterns & textures – A great way to add color and pizazz to a girls bedroom is by adding colorful pillows, rugs, bedding and accessories. Go with matching colors by selecting a color palette to create a themed room. Princess canopy – Whether its a princess canopy hanging from the wall or a four poster bed with curtains, they can allow the girl to dream and imagine herself in a magical place. Cute upholstered headboard – A regular bed can be transformed with an upholstered headboard that will make the bed an inviting place to curl up with a book or relax. You can buy one or create one yourself. 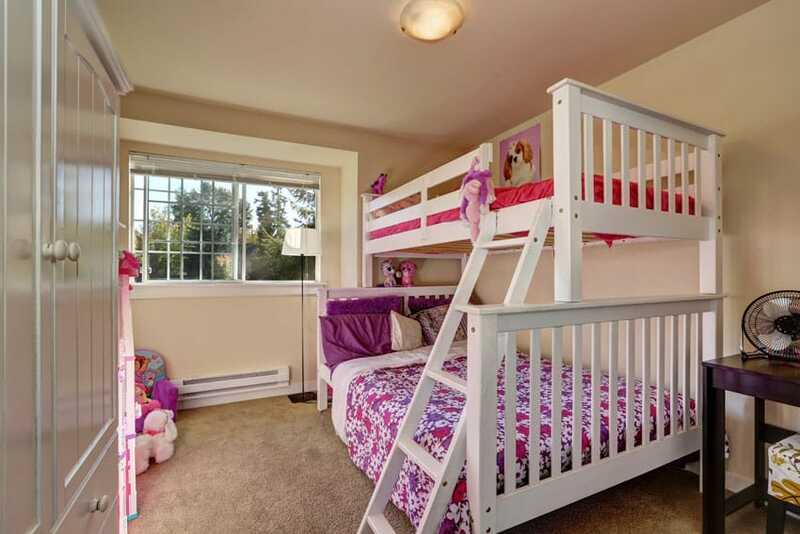 Bunk beds – Girls love bunk beds whether their for sleep overs with friends or just as an extra space to sit. Decorate them with colorful bedding to create an inviting spot for a restful nights sleep. A true space for sisters, kids love bunk beds because they love spending time with their siblings, and also the fun challenge of climbing the ladder and claiming the top bunk for themselves. The plain white large bunk bed is personalized with fun bedsheet prints in pink and purple, as well as stuffed animals littered neatly all around the room. The beige tones of the walls and carpet tone down the intense pink and purple colors, while the framed curtain looking out into the trees brings in sunlight and nature into the room. A wall mural featuring Barbie and fanciful shades is well-illuminated with the downlights positioned on the drop ceiling above it. The bed, flushed to the wall and laid out horizontally is decorated with purple bedsheets, a matching with the all pink casework and cabinetry shelves surrounding it. To the side, the drawers are organized in a stair-like manner. Besides acting as a good storage space, kids will have fun climbing up and down the blocks, and can be used as a reading corner as well. A bed canopy over a butterfly-patterned metal bed frame is sure to make any little girl feel like a princess. The crown-shaped mirror to the side also emphasizes this idea, and the delicate fabric of the canopy is matched by the dainty pink curtains beside the windows. Pink furniture and bedsheets adhere to the little girl’s favorite color, but using beige for the walls and grey for the carpet ensures that the room doesn’t go over the top and still maintains a sense of style. 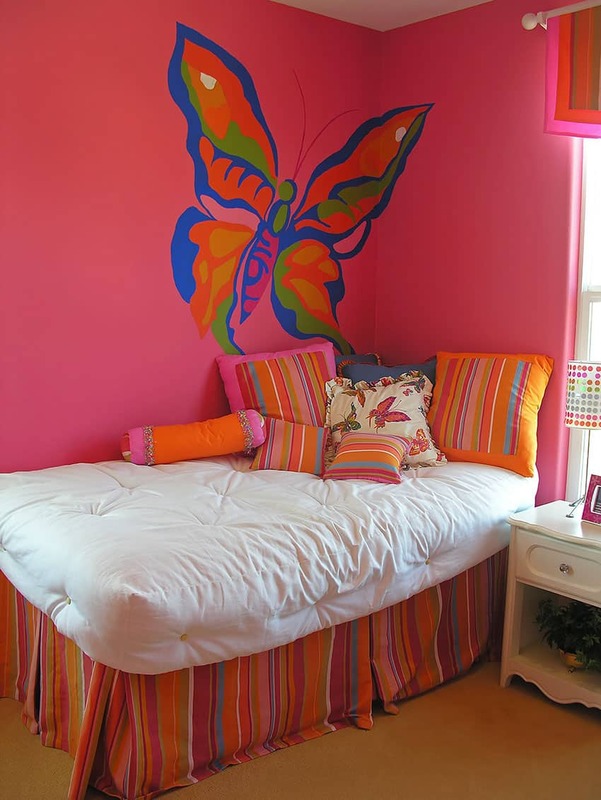 A large butterfly mural on the corner of the room adds an air of fantasy and imagination to a hot pink little girl’s room. Plain white bedsheets and a classic white side table contrast with the colorful pinstriped pillows and bed valance, as well as a colorful polka dot night lamp. The curtains over the white double hung window also follow suit with the colorful pink, orange and green pattern. 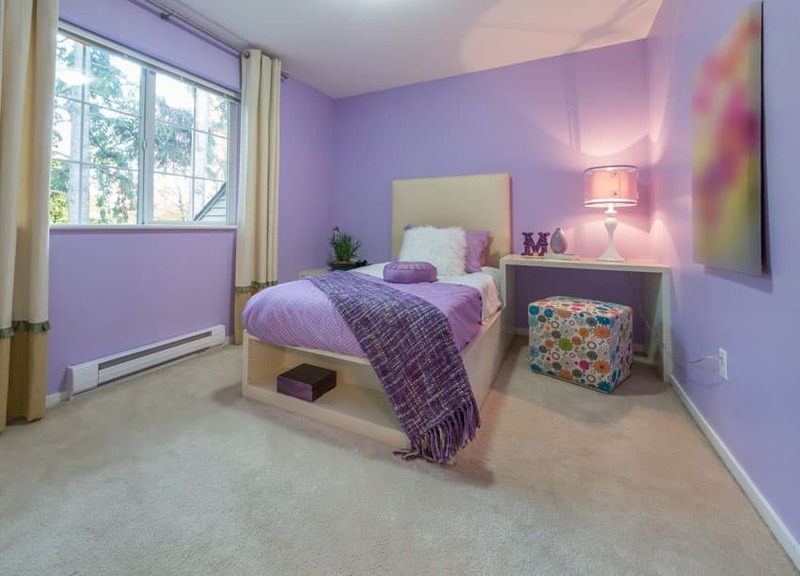 Lavender provides a warm, soothing yet lovable shade for this children’s bedroom. To tone down the bright purple color, the room was decked with beige carpet and beige curtains over the white framed windows and a beige bed frame. More purple accents are seen in the bedding, pillows, night lamp and abstract art hanging on the wall. Youthful bedside plants and storage box liven up the space. 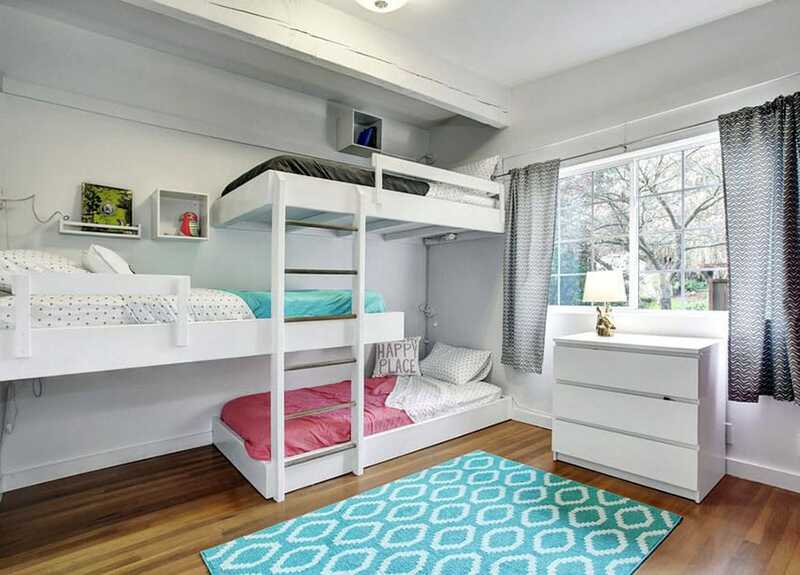 Children will love the fun challenge of climbing to the top bunk for sleeping, while studying or playing house in the study / play space tucked underneath. The white bedframe and white tables stand out from the sky blue walls and warm wood flooring. The neutrality of this space allows much creativity in styling using stickers, decals and murals, which was shown here with the tree mural on the bedframe and the sky mural on the wardrobe. 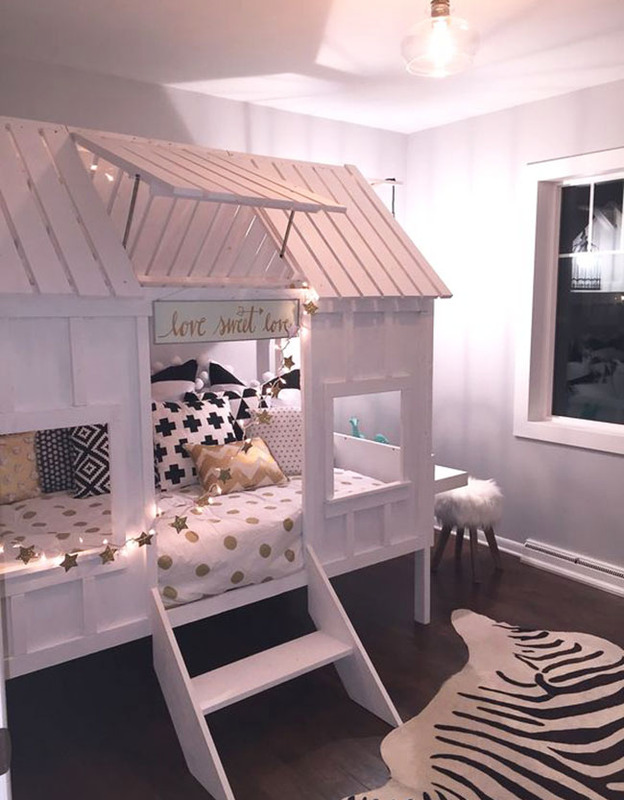 This chic girl’s bedroom is for the child who wants to be a designer one day, with the white bedframe and bedsheets, cubical shelves and study table. The white is accented by brown and green textiles for the throw pillows and storage baskets, but still remains youthful with the addition of pink storage boxes, stuffed aninals, animal, star and rainbow wall decals and a framed self-portrait. The combination of white wood floors and white brick walls tie the whole look together and give it a chic, young designer feel. Muted tones of pink and purple go great with the wooden study table and warm wood floors and baseboards of this little girl’s room. A shelf below the pair of windows on the left wall is useful for storing books, potted plants, and stuffed animals, and makes a great ledge from which kids can look and view the outdoors. The bed is flushed right to this shelf and is decked in printed pink, blue and purple bed sheets. A stack of storage boxes in pink, wood and blue is not only functional but adds to the room’s color balance. A highly whimsical Disney-inspired carriage-shaped bed in wrought steel painted gold is decked with pink patterned bedsheets and stuffed animals, that match the curtains over the white mullioned windows. The ceiling fan is made youthful with its heart-patterned blades, as does the pink wall decked with dainty pink, white and black decorations and statement posters. The carpet, although in a neutral beige, is spotted with different area rugs in pink or animal print. The bright purple walls and warm redwood floors bring out the detail in the beautifully carved wooden furniture painted in white, especially the large wardrobe, the four-poster bed and the small loveseat at the foot of the bed. Decked in hot pink bedsheets and a black bed valance, a sheer white canopy held together by a pink bow at the top of the bed ties the whole look together. A semi-circular bay window at the end of the room decked in white cabinetry and sheer curtains gives children a place to play, as well as hide their toys. The white barn-style bunk bed with ladder and drawers is a fresh piece of furniture amidst the room’s mint green walls. Pops of color are seen in the yellow open shelves, the pink and green chairs, and the pinstriped pink-yellow-green area rug over the beige carpet. Sheer pink curtains bring in natural light, while a corkboard hanging on the wall gives little girls plenty of room to stick pictures with their friends and family. 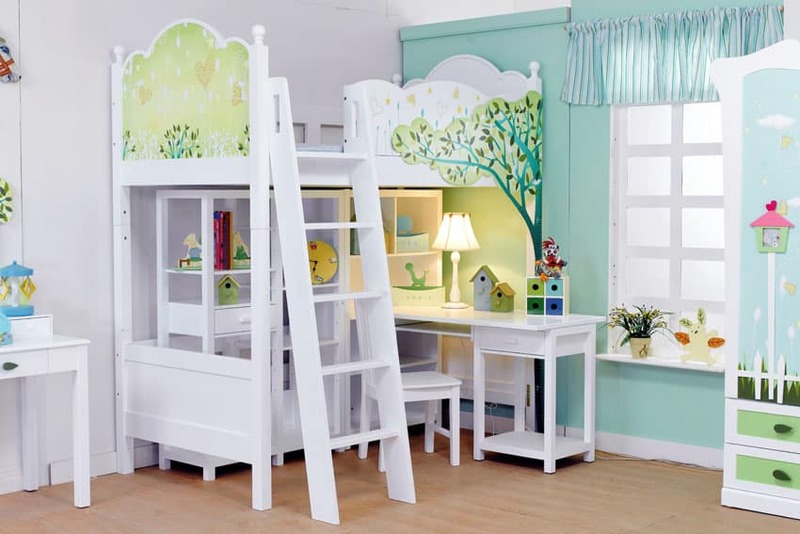 Sure to make many little girls feel like they have their own dollhouse, the design of this bunk bed looks like a small white wooden cabin was built right inside their room, made even better that the bed is right above the house. Pale pink walls and white furniture match with the beige carpets and white mullioned windows. Accents such as the butterfly-shaped mirrors and heavy wooden child-sized furniture give the room a Contemporary Classic feel, which matches with the rest of the house, seen through the doorway. The sloping ceiling of the attic walls are made light with many white mullioned windows framed with pale pink curtains. The bright yellow walls also bring in more of the sunny feel, along with the off-white carpet and white baseboards and trims. Pale pink bedsheets match with the bright, pastel colors of the room, and rectangular shelves built into the walls make use of space functionally. 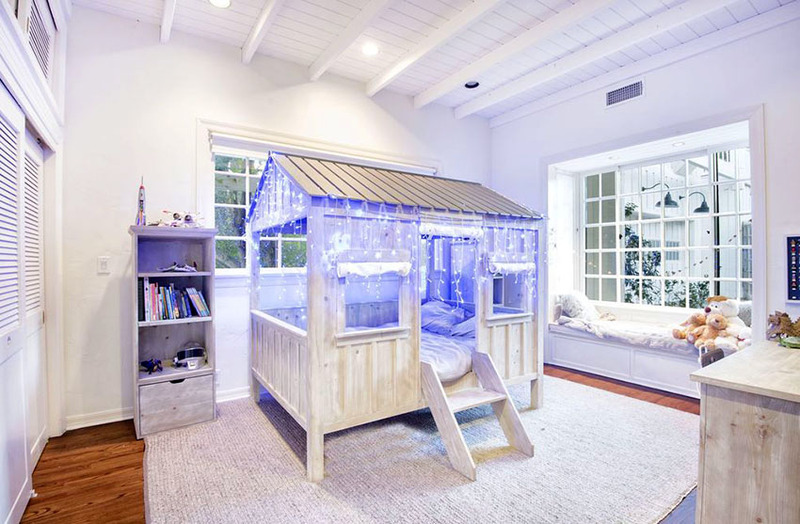 With a large tree complete with realistic looking bark and leaves in this bedroom, and a 2-storey house turned bed and study space, children can let their imaginations run wild in this outdoors-inspired bedroom for girls. The second floor of the “house” features the bed, reachable via stairs with storage shelves underneath, while the ground floor, complete with mailbox and roof eaves, serves as the study / play space. A dresser labeled “Olivia’s Boutique” makes the room feel very personalized. The built-ups themselves are in a white base color and are accented with pink and mint green trims. This country barn inspired bedroom for little girls comes with white bed frame and side tables that match with the off-white walls and carpet. To give it a touch of color, the bedsheets are in pale yellow over a blue checkerboard valance. Four large sliding windows looking out into the woods bring the outdoors in, and is further emphasized with the large stuffed animal horse at the foot of the bed, complete with carrot snack, and the flower vines growing all around the full-length mirror in the corner. This 3-layer asymmetrical bunk bed in white wood matches with the Scandinavian themes of white, grey and wood, but with colorful patterns to make it appropriate for children. The warm wood flooring is lightened up with a diamond patterned teal rug, while the beds are given polka dot bedsheets and pink, blue and grey blankets. The wide mullioned window brings in a lot of sunlight and is framed by grey pattern curtains. Small storage cubes on the wall are functional but also allow for more personalized décor. This room’s pink sloping walls are made light by the white ceiling, as well as the white shuttered windows that bring in natural light, framed by tropical-print valance curtains. The pink theme is continued with the sheer pink fabric canopy over the bed, as well as the pink patterned bed sheets, textured throw pillows and solid bed valance. Toning down the all-pink space are the beige carpet and transparent feature chair to the side. A silver chandelier and wind chimes hanging from the ceiling add whimsy to the space. The pink and purple pinstriped wall, matches the layered ceiling with pink drop ceilings and purple fascias, culminating in a cloud-painted recessed ceiling, from which a three-shade chandelier hangs. The chandelier is matched by the bronze wrought iron bed, mimicking a princess’s bed, along with its dark, royal bedsheets in deep maroon tones. The heavy tones of the bed are muted with the warm wood flooring, white door and trims, and the low bay window under the two double-hung windows facing the balcony. The rich wooden tones of the low cabinets and double bunk bed gives kids a great place to sleep, as well as play. The scarves hanging off the bedpost isn’t just functional, but goes with the purple color scheme of the room, and complements with vibrant tones of pink and blue. Plain white sheets on the bed as well as a beige area rug over pale wood flooring tones down the vibrant colors and dark wooden furniture. You can always expect the occupant of the top bunk to put her own prince’s poster on the ceiling! 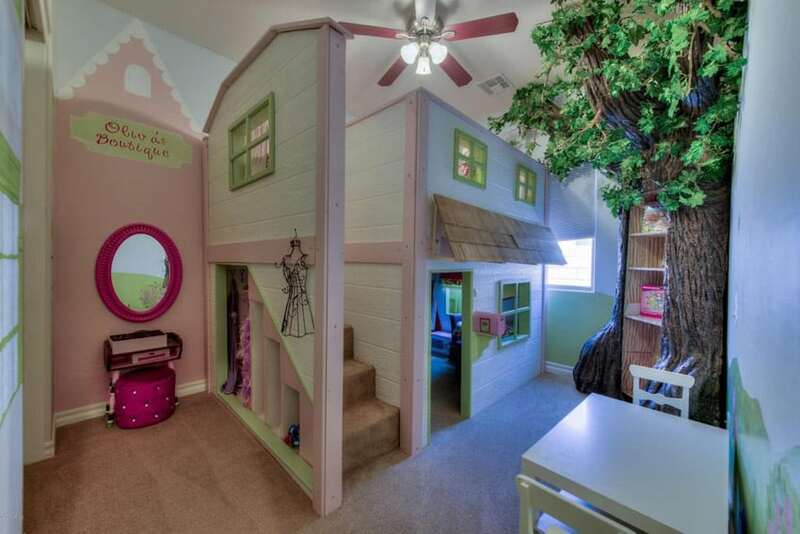 The earthy tones of the brown carpet and light green walls are matched by the flower and fence murals on the wall, with this little girl’s bedroom mimicking a backyard. The wooden four poster bed with pale pink sheets is also covered by a sheer pink canopy with pink petal details, making the bed feel like a flower pod. Matching the room design are the two double hung windows on either side of the bed, decked with sheer white butterfly-printed curtains. This retro modern dollhouse bed is chic yet youthful in its use of white paneling and slats, partnered with black and gold accents in the throw pillows, bed sheets and string lights. The dark wooden flooring and light grey walls match the chic retro feel, as do the animal accents of mint green zebra sculptures, furry stool, and zebra-print throw rug. A bell jar hanging lamp from the ceiling ties the whole look together and illuminates the bed interior through the open slot on the roof of the dollhouse. When searching for little girls bedroom ideas its fun to add a variety of patterns and textures that she likes to let her unique personality show in the design. This dollhouse bed features a more industrial modern feel, with the actual bedroom having a white painted ceiling, with the joists and beadboard ceiling exposed. The walls and cabinets are also in white, as is the entire framing of the bay window upholstered with soft cushions and decked with stuffed animals, facing a large mullioned window to the outdoors. The dollhouse bed features pale white wood and a tin shed roof, and is decorated with pale white lights, perfect not just for sleeping but making the imagination go wild while just in bed. The warm wood ceiling and beige area rug give this cool white space a sense of comfort and home.